We made this Steak Pizza with Caramelized Onions, Gorgonzola & Rosemary for the first time last summer. We dreamed about it for a good week afterward - it was that good. That's a good throwback post - you should take a look. The Stallion seems to think those iPhone pictures make this pizza look more delectable than the PHENOMENAL ones I'm sharing with you right now. I'm currently resisting the urge to smack him in the face. 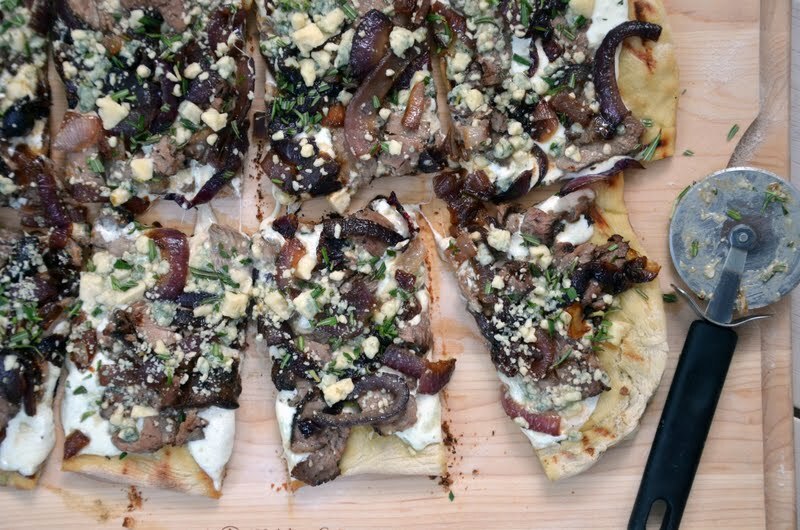 We finally ventured out and tried pizza on the grill, and we were not sorry. But we were wussies. 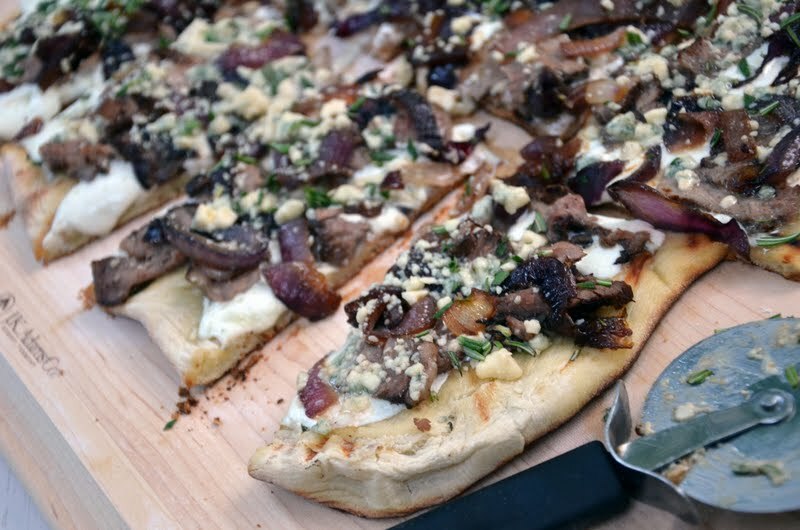 We parbaked the crust on a sheet pan in the oven before we put it on the grill. So much for a great summer recipe that keeps you out of your kitchen because you can't stand the heat. But that's okay. Because this pizza is worth it. The delectable toppings: leftover grilled steak, fresh mozzarella, caramelized onions, Gorgonzola, fresh rosemary. Leftover steak because it's too much work to grill a steak only to wait to make it into a pizza before you can eat. 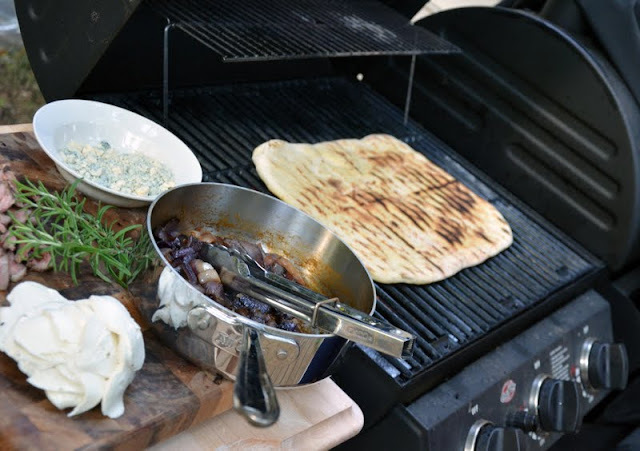 Rub your grill grates with olive oil (paper towel soaked with oil, held with tongs is the easiest way to do this) and brush both sides of the crust with plenty of olive oil as well. Over medium heat, grill the crust for a few minutes until golden brown, then flip. Then caramelized onions. Lots and lots of caramelized onions. Sprinkle with the Gorgonzola, close the lid, and let the pizza cook until the toppings are hot and the cheeses melted. Make sure your heat isn't too high or you'll return to a black crust. Finish with chopped fresh rosemary after you remove it from the grill. This is a pretty hefty pizza, and grilling it gave the crust its crispy strength that held up to the weight of the toppings much better than it would have if baked in an oven. 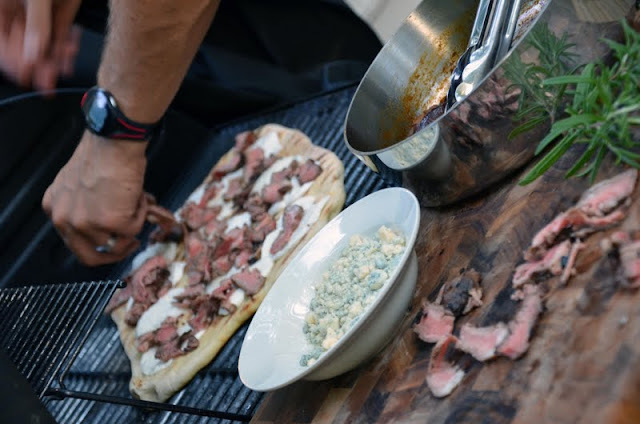 Grilling is a great method for making pizza, and I highly recommend it if you're planning to layer on the toppings - the crust will be so much stronger. Swap in your favorite toppings and tell me how it works! Cut onions in half, then slice thickly. Heat a saucepan over medium heat and add a 2 count of olive oil along with 1 tablespoon of butter. Add the sliced onions, sugar, and salt and cook, stirring occasionally, for 15-20 minutes, until dark brown and caramelized. Preheat oven to 425 degrees; heat a grill to medium. Roll the pizza dough out on a floured work surface until you reach an even 1 inch thickness or less. Use some olive oil to grease a baking sheet; transfer the rolled pizza dough to this pan and place in the oven for 5 minutes. 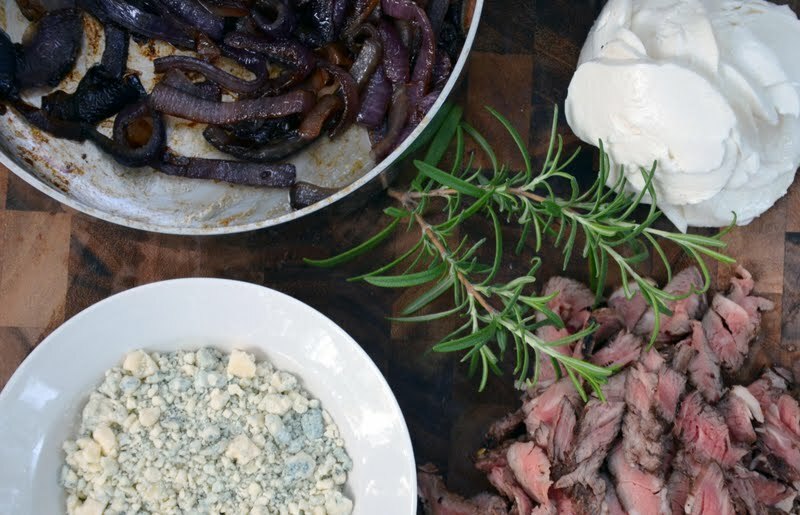 While the dough is in the oven, prep your toppings: slice both the mozzarella and steak thinly, crumble the gorgonzola if needed, and roughly chop the rosemary. 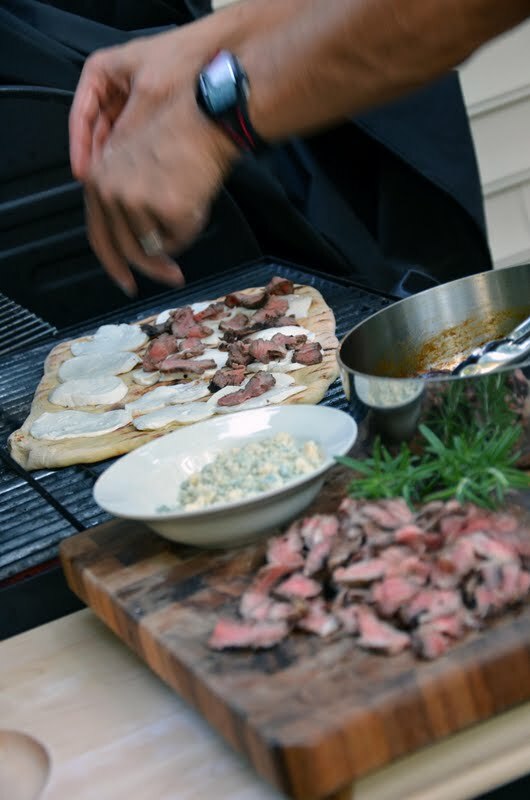 Take all ingredients out to the grill. Grill the dough on one side until golden brown, about 3-4 minutes. 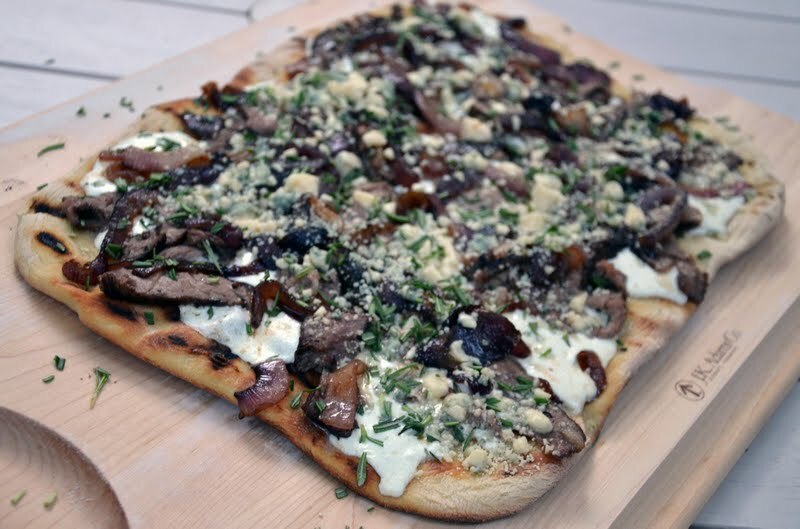 Flip the dough and layer on the toppings: mozzarella, steak, onions, gorgonzola. Close the lid and allow to cook 5 minutes more, until all toppings are hot and cheese is melted. Take care that the heat is not too high, or the crust will burn. 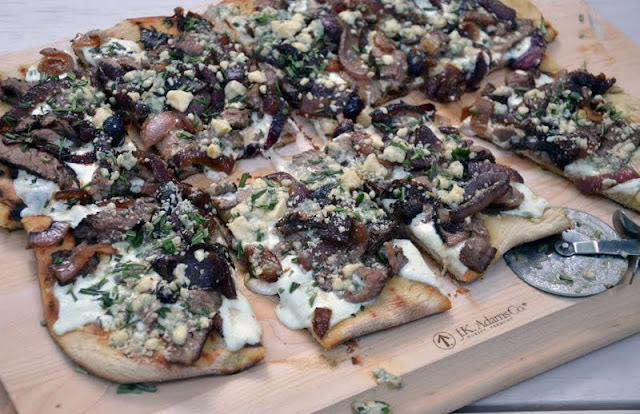 Remove the pizza from the grill, sprinkle chopped rosemary on top, then slice and serve. Caramelized onions are seriously one of my absolute favorite things ... looks delicious! You can even par-bake the pizza right on the grill! Supa easy. Yum, yum! @lesley - I know RIGHT. Yum. @Bev - I know. Told you we're wussies. I was all 'let's do it!' and The Stallion was all 'I'm the grillmaster and I say no.' Scaredy cat. Grilled pizza is where it's at. It's SO much easier and tastier that doing it in the oven! BIG big fan of grilled pizza. This looks sensational! Every single ingredient on this pizza looks so good. Perfect addition to the grill. 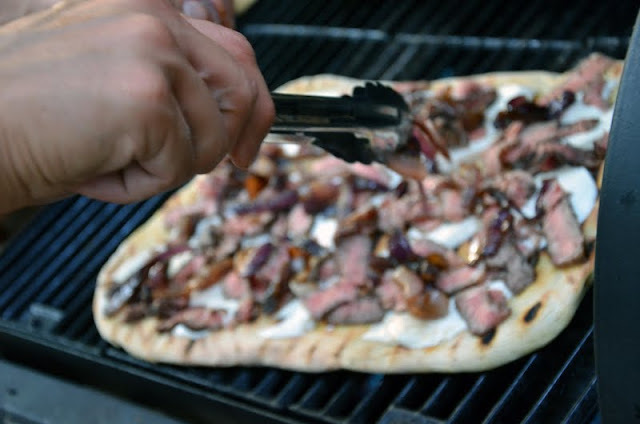 We are loving grilled pizza this summer too!